In the corner of my office sit two baseball bats. Both have special stories behind them. Both belonged to heroes of mine whose lives are presently going in opposite directions. Gary Carter, Hall of Fame catcher, gave me one of his bats during the 1976 season while playing for the Montreal Expos. As a result of the special friendship forged with Carter an outreach to professional athletes, Epistle Sports Ministries, was born. Now, over 35 years later Gary Carter is battling for his life with stage 4 brain cancer taking its toll on this fine man. Our prayers go up on behalf of Gary, his wife Sandy and his incredible family. The other bat belonged to Mike Matheny, one of the finest men I had the pleasure of meeting in the game of baseball. Matheny only spent one season with the Toronto Blue Jays (1999) but we became good friends. One Sunday following the chapel service Mike presented me with a beautiful black Louisville Slugger bat with a very personal inscription written with a silver Sharpie. There’s a story behind that bat but I’ll leave that for another time. 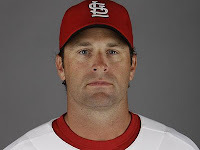 Earlier this week Mike Matheny was named manager of the World Champion St. Louis Cardinals taking over from Tony LaRussa who retired after leading the Cards to their World Series victory. As one headline stated, “Matheny is short on managing experience but long on character”. He is a fine, godly man. So is Gary Carter. Two bats, two godly men, two divergent courses of life. 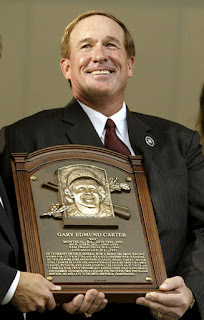 One wonders why God allows such a special husband, father, grandfather, friend as Gary Carter to go through this horrendous struggle for his life. “Why Gary?”, I mumbled last night. “Why him?” Meanwhile Mike Matheny is realizing his dream. Managing the Cardinals for whom he played and coached. God has His reasons for allowing these circumstances to intersect with the lives of His people. Somehow, through it all, God will receive glory and lives will be impacted for eternity.